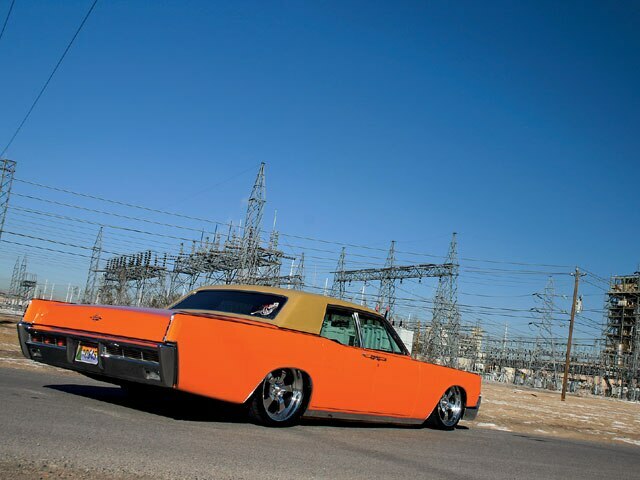 The Heat Was On For This High-Speed '66 Lincoln Build. The annual SEMA show in Las Vegas, Nevada, is the biggest aftermarket car event of the year. Tens of thousands of people in the industry show up to see the hundreds of cars and trucks on display. 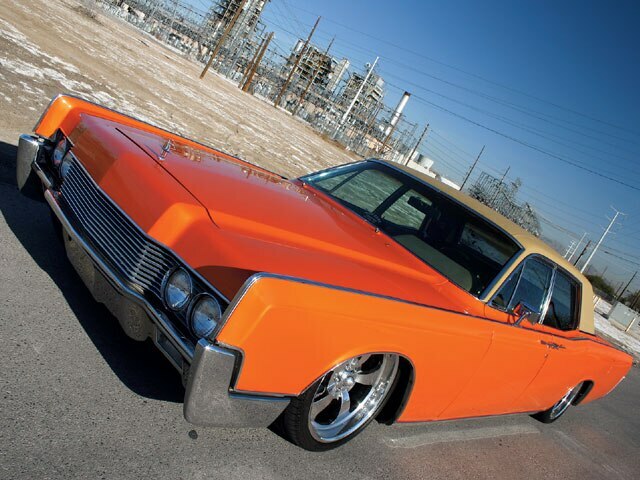 One of those cars was the bright orange ’66 Lincoln Continental seen here, owned by James Bean of Las Vegas. How it got there, though, is a whole other story. But first, a little background. James is a custom car guy, and has been for years, having owned a series of custom compacts and imports. Then he stumbled upon his dream ride, a ’66 Lincoln Continental. His parents had bought one brand new and sold it in the ’80s for way less than it was worth. Ever since then, James had wanted one, and after he found this ’66 for $4K, he snatched it up and started in on it. The car was in excellent running condition, which was good because James wanted to get it painted and done up in a fairly short amount of time. Enter Adam Hartley, a custom car builder and good friend of James. Adam’s built a few SEMA cars in his time, and has quite a few magazine features and sponsors to show for it. He took James under his wing and said, “If you want to get this done for SEMA, you need to have $10 Gs and a lot of time to spare, or I can’t help you.” James gave Adam the go-ahead and the build was on. Six months before SEMA, phone calls were being made, sponsors were being acquired and parts were being shipped. The car was on its way to being ready for the show. The car needed some bodywork, and James wanted a few things shaved, so he went to his friend Tony Leveck of Las Vegas to help him out with the process. The car was then blown apart to paint the jambs and get the car ready for paint. The interior was all gone, and the suspension wasn’t done. It was now just two weeks before SEMA and the car was just a shell. Time to get things moving! Things really flew by in the last two weeks. Adam, James and their mutual friend Anthony Pallan started to work on the suspension. Interesting fact about the Lincoln: it’s a unibody. That’s right, no frame to work with. So they went to town customizing the suspension to hold a set of 2600 Firestone airbags. The car could still go lower, but James wants to keep the integrity of the unibody in place. The car also has factory disc brakes, which is pretty impressive for a ’66. Next came the paint. In came Chris Haynes from Las Vegas to lay down the House of Kolor Tangelo Orange pearl. Chris painted the jambs and various interior pieces to match the car. Around that same time the custom roof was laid down. It’s a brown vinyl phantom top with foam underneath, and it accents the car nicely. The painted car was reassembled with freshly chromed bumpers, done by APC in Las Vegas. While the car was being painted, the interior was off at Friend’s Upholstery in Henderson, Nevada. The car was completed just hours before SEMA, where it was a big hit, but there are still a few loose ends that James wants to clear up before he sells the car. That’s right, James is selling this car. What’s he planning on getting next? Believe it or not, another ’65-’67 Lincoln. This time, he’s going all out on it, as if this car wasn’t enough. Maybe he’ll work on getting it done in time for this year’s SEMA show. Body/Paint: Tony Leveck of Las Vegas shaved the side and front emblems, and then James and Tony blocked it out to perfection. Chris Haynes from Las Vegas laid down the House of Kolor Tangelo Orange pearl. Chris painted the jambs and various interior pieces to match the car. A custom brown vinyl phantom top accents the car nicely. Interior: Friend’s Upholstery in Henderson, Nevada, wrapped the seats in light brown ultra-leather with orange piping. James then bolted up a Colorado Customs billet steering wheel and adapter. Setup: Adam Hartley and Anthony Pallan helped James customize the unibody suspension to hold a set of four 2600 Firestone airbags with three Viair compressors, one 5-gallon tank, 1/2-inch DOT airline and 1/2-inch Parker valves.